If you suffer with joint pain and joint stiffness, exercise and adding stretching into your daily routine could be particularly helpful to reduce the symptoms. Exercise not only helps to relieve these symptoms but could also reduce any unwanted weight and improve your mood. Though some people may think that exercise will aggravate joint pain and stiffness, that’s not the case. Lack of exercise actually can make your joints even more painful and stiff. Keeping your muscles surrounding your joints strong is crucial to maintain support for your bones. Not exercising can weaken those supporting muscles, creating more stress on your joints. Warming up by walking on the spot or pumping the arms while sitting or standing for 3 to 5 minutes. Holding each stretch for 10-20 seconds before releasing it. Repeating each stretch 2-3 time. Walking is a low impact form of exercise that can help with aerobic conditioning, heart and joint health, and mood. It is sensible to walk slowly initially and then increase the pace when possible. Both Tai Chi and yoga combine deep breathing flowing movements, gentle poses and mediation. They increase flexibility, balance and range of motion whilst also reducing stress. Pilates is a low impact activity that stabilises the muscles around them. People new to Pilates should begin with a routine that uses a mat rather than a machine to build muscle safely. Water helps to support body weight, which means that water exercises do not impact heavily on the joints. Swimming or water aerobics and other gentle water exercises can increase flexibility, range of motion, strength and aerobic conditioning. They can also reduce joint stiffness. Riding a stationary bike can be a safe way to get the joints moving and improve cardiovascular fitness. In addition to improving aerobic conditioning, cycling can reduce stiffness, increase range of motion and leg strengthen and build endurance. Strengthening the muscles around the affected joints can help to increase strength as well as reduce the symptoms that come with joint problems. 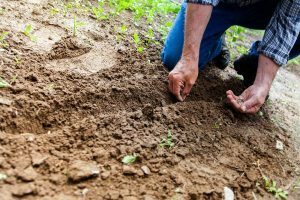 As well as being a form of exercise, gardening offers the benefit of improving your mood. People should be gentle with their body, work slowly and avoid overstraining the muscles and joints. You might notice some pain after you exercise, if you haven’t been active for some time. In general, if you are sore for more than two hours after you exercise, you were probably exercising to strenuously. Trust your instincts and don’t exert more energy than you think your joints can take. Take it easy and slowly increase your exercise length and intensity as you progress. Before starting a new exercise routine, it is best to consult your GP, or a fitness expert who will be able to offer advice on the best exercises and routine to meet your needs. When keeping your joints healthy, one of the important aspects is maintaining a healthy diet to ensure you get key nutrients and vitamins. A healthy diet can also help to lose any unwanted weight that could put pressure on your joints. Although there is no diet cure for joint problems there are a number of foods that have been shown to fight inflammation, strengthen bones and boost the immune system. Along with a balanced diet, adding all or some of these foods to your diet may help to ease the symptoms. Certain types of fish are packed with inflammation fighting omega 3 fatty acids and experts recommend at least three to four ounces of fish twice a week. Omega 3 rich fish can include salmon, tuna, mackerel or herring. 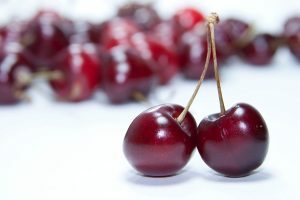 Studies have shown that cherries help to reduce the frequency of gout attacks and research has shown that the anthocyanins found in cherries have an anti-inflammation effect. Anthocyanins can also be found in other red and purple fruits, such as strawberries, raspberries, and blackberries. Low fat dairy products like milk, yoghurt and cheese are packed with calcium and vitamin D, both found to increase bone strength. Vitamin D is essential for calcium absorption and it has been shown to boost the immune system. Rich in vitamin K and, broccoli also contains a compound called sulforaphane, which researchers have found could help prevent or slow the progression of osteoarthritis (OA). Broccoli is also rich in calcium, which is known for its bone-building benefits. Green tea is packed with polyphenols, which are antioxidants believed to reduce inflammation and slow cartilage destruction. Studies also show that another antioxidant in green tea called epigallocatechin -3 -gallate (ECCG) blocks the production of molecules that cause joint damage in people with rheumatoid arthritis. Fruits like oranges, grapefruits and limes are rich in Vitamin C and research shows that getting the right amount of vitamin can aid the prevention of inflammatory arthritis and maintain healthy joints. 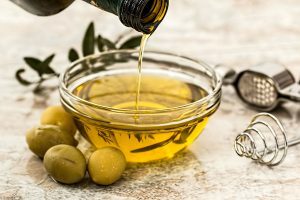 Extra Virgin Oil is loaded with heart-healthy fats, as well as oleocanthal, which has properties similar to non-steroidal, anti-inflammatory drugs. However, it’s not the only oil which contains health benefits, Avocado and Safflower oils have shown to lower cholesterol and Walnut oil has 10 times Omega -3 than olive oil. Whole grains are known to lower levels of C-reactive protein (CRP) in the blood. CRP is a marker of inflammation associated with heart disease, diabetes and joint problems. Foods like oatmeal, brown rise and whole grain cereals are excellent sources of whole grains. Beans are packed with fibre, a nutrient that helps to lower CRP. They are also an excellent and inexpensive source of protein, which is important for muscle health. Some beans are rich in folic acid, magnesium, iron, Zinc and potassium, all known for their heart and immune system benefits. Look for red beans like Kidney and Pinto beans. Studies have shown that people who regularly at foods from the allium family, such as Garlic, onions and Leek, shared fewer signs of joint disease. Researchers believe the compound Diallyl disulphine, which is found in garlic, may limit cartilage damaging enzymes in human cells. 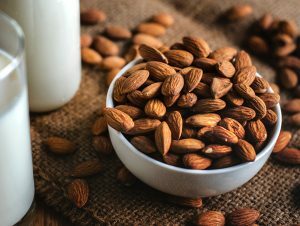 Nuts are rich in protein, calcium, magnesium, zinc, vitamin E and immune boosting alpha linolenic acid (ALA), as well as filling protein and fibre. They are heart-healthy and beneficial for weight loss. Try walnuts, pine nuts and almonds. Although there is no cure for joint problems such as arthritis as it is a degenerative disease, eating a healthy diet and taking natural, nutritional supplements can reduce the symptoms and manage pain that comes with joint stiffness. 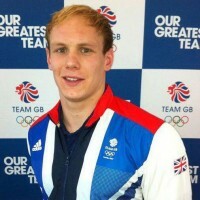 http://www.nutrabiotics.co.uk/wp-content/uploads/2017/07/nutrabiotics-logo-new.png 0 0 Laura Evans http://www.nutrabiotics.co.uk/wp-content/uploads/2017/07/nutrabiotics-logo-new.png Laura Evans2019-02-28 11:50:192019-02-28 11:52:49What are the best foods for arthritis and joint problems? There are many health benefits of stretching and incorporating it into your exercise routine, from increasing flexibility to reducing stress and body aches. Regular stretching can help to increase your flexibility, which is important as flexibility helps you to perform everyday activities. It can also help to delay the reduced mobility that can comes with aging. Stretching on a regular basis can help to increase your range of motion. Being able to move a joint through its full range of motion gives you more freedom of movement. Performing dynamic stretches before any physical activity has been shown to help prepare your muscles for the activity. Stretching regularly may improve your circulation. Improved circulation increases blood flow to your muscles, which can shorten your recovery time and reduce muscle soreness. Muscle imbalances are common and can lead to poor posture. Slouching and poor posture can put extra pressure on your joints. Tight muscles can lead to a decrease in your range of motion. This can then lead to an increased chance of straining the muscles in your back. Stretching can help to heal existing back injuries by stretching the muscles. Regular stretching can also help to prevent future back pain. When you’re experiencing stress, there’s a good chance your muscles are tense. This is due to your muscles tightening up in response to emotional stress. When stretching you should focus on areas where you hold your stress, such as you neck, shoulders and upper back. Regular stretching can help to calm your mind. While you stretch, focus on mindfulness and meditation exercises, which gives your mind a mental break. Tension and stress headaches can interfere with your day to day life. In addition to a proper diet, adequate hydration and plenty of rest, stretching may help reduce the tension you feel from headaches. If you are new to stretching take it slow and let your body get used to the new routine. Aim to stretch for around 5-10 minutes per day, even if you don’t plan on exercising that day. Try to focus stretches on areas that help with mobility, such as calves, hamstrings, hip flexors and quadriceps. There are many health benefits of boswellia. It has been used for thousands of years as botanical medicine and is continued to be used today because of its powerful and fast acting effects. It is more commonly known today as Frankincense (Indian), through it’s Biblical references. Boswellia (boswellia serrata) is a botanical medicine sourced from the resin of the boswellia tree, which is native to North Africa and India. The particular species of ‘Boswellia serrata’ mainly grows in mountainous forests of western and central India. The resin, which is secreted naturally to protect the Boswellia trees is tapped and purified for use in powder form. This gum tree resin consists of essential oils, gum, and terpenoids. Boswellia extract is rich in boswellic acid and in herbal medicine and is often used to help treat joint and bone conditions, such as osteoarthritis, rheumatoid arthritis (RA) and even asthma and inflammatory bowel disease. 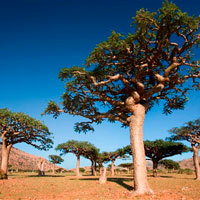 This is because many studies have shown that boswellia may naturally reduce inflammation. In fact there are over 400 independent clinical studies supporting its use. Boswellia can also be used to support and hasten the body’s natural healing of wounds, bones and bruises. Besides being an effective anti-inflammatory, boswellia can be an effective natural painkiller and may also prevent the loss of cartilage. A study published in 2008 suggested that boswellia may reduce pain and boost the physical capability of people with osteoarthritis of the knee. An earlier report from 2006 also suggested that boswellia may be useful in the treatment of rheumatoid arthritis. A 2003 study published in the journal Phytomedicine, found that all 30 patients who were reported to have Osteoarthritis knee pain and received boswellia, reported a reduction in the pain they experienced. They also indicated an increase in the distance they could walk and flexation of their knee. 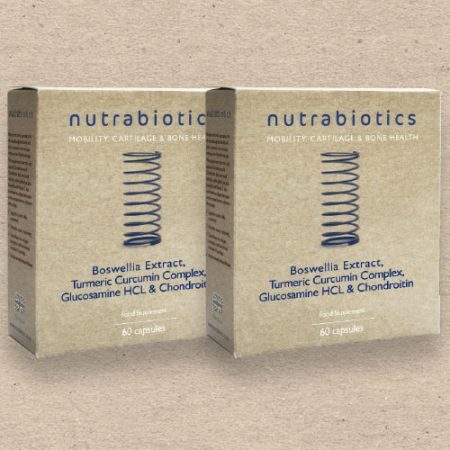 Boswellia is an exciting nutrient with many anti-inflammatory health benefits and Nutrabiotics has combined Boswellia Extract with Glucosamine HCL, Chondroitin, Vitamin C & Hyaluronic Acid to create a specially formulated supplement to help joint pain, mobility, cartilage & bone health. Sengupta K, Alluri KV, Satish AR, Mishra S, Golakoti T, Sarma KV, Dey D, Raychaudhuri SP. “A double blind, randomized, placebo controlled study of the efficacy and safety of 5-Loxin for treatment of osteoarthritis of the knee.” Arthritis Res Ther. 2008;10(4):R85. Ammon HP. “Boswellic acids in chronic inflammatory diseases.” Planta Med. 2006 72(12):1100-16. It’s common for most people to experience aches and pains in muscles and joints from time to time. This is especially common if you exercise regularly or overstretch but many people won’t experience persistent or severe symptoms. There are several common types of arthritis, with more than 10 million people in the UK suffering from some form of the condition. However, it is not just a health issue for older people, around 12,000 children under the age of 16 also suffer from some form of juvenile arthritis. Arthritis refers to more than 100 different types of diseases which all cause pain, stiffness, and inflammation of the joints. All arthritis conditions involve some form of joint pain. However, the seriousness, duration and degree of the joint pain vary from one type of arthritis to another. There are some familiar symptoms that can be linked to the most common types of arthritis, which include, early morning joint stiffness, tiredness, a general feeling of being unwell and weight loss. The most common types of arthritis include, osteoarthritis, rheumatoid arthritis. Osteoarthritis is one of the most common types of arthritis, which is where the joint cartilage is destroyed. This causes the joint to not move as smoothly as it should and can make movement of affected joints difficult and painful. It is sometimes referred to as arthrosis or osteoarthrosis. In other cases of osteoarthritis, the patient experiences bony outgrowth, also known as bone spurs, as well as loss of cartilage particles. The intensity of pain from osteoarthritis can vary from person to person from mild to severe. Osteoarthritis affects mostly people aged 40 plus, however it can be evident in younger people too. Osteoarthritis can affect any joint, especially if it has been badly injured, but is most common in the hands, feet, spine, hips and knees. Rheumatoid arthritis is the second most common type of arthritis in the UK. It is a form of inflammatory arthritis where inflammation of the joints occurs for no particular reason. Inflammatory arthritis is mostly recognised by swelling and inflammation of the synovial membrane, which causes serve pain and stiffness in a persons joints. People with rheumatoid arthritis experience white blood cells in the synovial membrane dividing, growing and multiplying. These lead to inflammation of the joint capsule and synovial membrane, loss of space in the synovial cavity, pain and stiffness in the joint. If there is no arthritis relief and treatment, this may lead to cartilage destruction. In the UK there are around 400,000 people with rheumatoid arthritis and it can affect adults of any age. However, it is more likely to start between the ages of 40 and 50. Genes you inherit from your parents may increase your chances of developing the condition, however genetic factors alone do no cause it. Arthritis can affect people in different ways and pain can vary from day to day. There is no cure for arthritis, but there are some measures to take to help manage the condition. It’s important to keep the joints moving. It is suggested that the stronger the muscles that support the joint, then the less pain you’ll have in the joint. There are number of exercises you can do to help support joint mobility, such as stretching exercises, which can help to ease aches and pains and get the best movement from your joints, as well as strengthening exercises. Swimming is also encouraged, as it’s a great all round form of exercise for arthritis suffers as the joints are supported by the water, which makes it easier to move. If you are overweight then you should consider reducing your weight to avoid unnecessary strain on the joints. 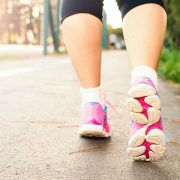 If you are overweight, losing two stone is said to reduce pain in the knee by 50 per cent. Eating a health low-fat balanced diet can also help to improve your general health, and will also help with weight loss. Fruit and vegetables are rich in antioxidants, which help to fight the inflammation associated with arthritis. An antioxidant supplement can also help. Other joint supplements to try include, Chondroitin and Glucosamine supplements and Boswellia, which works as a natural inflammatory and can help sufferers quickly through its fast acting nature. Turmeric is also a very powerful anti-inflammatory ingredient, it is not only fast acting, but when taken with Boswellia they have been independently proven to work harmoniously, which produces a safe yet effective anti-inflammatory and anti-oxidant combination. If you are suffering from persistent joint pain, or severe symptoms of arthritis then you should visit your GP to get advice on how best to manage your specific condition. There are many joint supplements on the market and this makes it very difficult to know what’s best for you, especially with such variety in price too, so we’ve created this simple guide to help you understand what to look for in joint supplements. 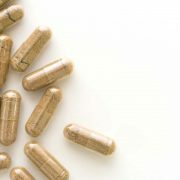 On the face of it many joint supplements can seem to be good value, however many are very low in strength. Therefore it’s important to compare the milligrams (mg) strength of a product and how many mg’s each capsule/tablet delivers for the required dose, as often many more capsules/tablets are required for a true comparison. By comparing the mg strength of a product and how many mg’s each capsule/tablet delivers for the dose price/day the true value of a product can be determined. You need to know exactly what a product contains, therefore you should ensure products contain 100% active ingredients without any added bulking agents or fillers and avoid land animal sourced ingredients as they are cheap alternatives to marine or plant sourced ingredients. When a product is made in the UK it has to meet the latest EU regulations that others do not. Also look for a product that is manufactured to GMP (Good Manufacturing Practice) standards and always ensure ingredients are ethically sourced. A respectable company will guarantee their label claim by stating the percentage purity (%) of their key active ingredients so you can be assured of consistent product quality and efficacy. 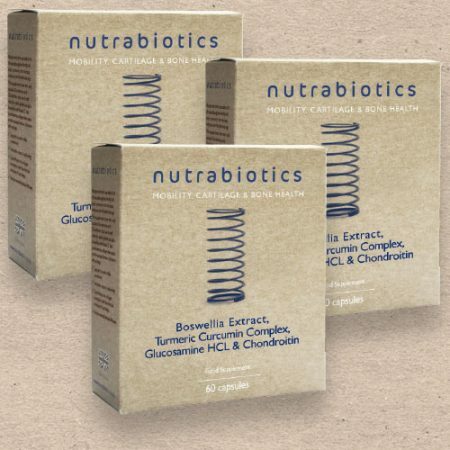 There are only a handful of companies in the UK who will guarantee this, Nutrabiotics are one of them. Tablets need to be bulked out with high fat binding agents thus reducing the purity of the product. Sprinkle capsules are low in fat and are more flexible for administration, look for sprinkle capsules that contain 100% active ingredient. Glucosamine is an amino sugar often made from shellfish or prepared in the laboratory. 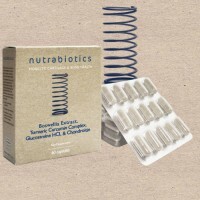 There can be many benefits of glucosamine, which is available in two forms, glucosamine hydrochloride and glucosamine sulphate. Nutrabiotics uses the natural form of glucosamine, which is naturally sourced from shellfish. Glucosamine is found naturally in your body and plays an important role in making glycosaminoglycans and glycoproteins, which are essential building blocks of many parts of your joints, including ligaments, tendons, cartilage and synovial fluid. Animal studies have found that taking glucosamine can delay the breakdown of cartilage as well as rebuild it. The body’s natural glucosamine is used to make and repair joint cartilage, but taking a nutritional supplement that contains glucosamine can help repair the damaged cartilage by adding to the body’s supply of glucosamine. Taking a daily dose of glucosamine can also help to improve mobility and address the pain of arthritis. Glucosamine is an ingredient commonly used in supplements taken by people suffering osteoarthritis, the most common form of joint disease. In osteoarthritis, cartilage – the material that cushions joints – becomes stiff and loses elasticity. This makes the joint prone to damage and may lead to pain, swelling, loss of movement, and further deterioration. Glucosamine is thought to help slow or prevent the degeneration of joint cartilage, the underlying cause of osteoarthritis pain. Reduce osteoarthritis-related pain, stiffness and swelling in the joints. Provide continued relief or symptoms for up to 3 months after someone stops treatment. A glucosamine supplement can also help to reduce cartilage breakdown and maintain collagen synthesis in athletes involved in various sports, including football and cycling, as well as high impact sports such as running. In a study where 106 athletes with an acute knee injury took either glucosamine or a placebo, those that took glucosamine saw a significant improvement in knee flexion and extension, compared to the other group. Glucosamine works particularly well with chondroitin and when taken together can strengthen joints. This combination works particularly well for people that like high intensity workouts, which can be demanding and can put a lot of pressure over the bones and especially over the joints. 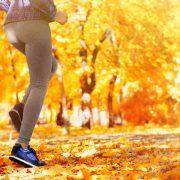 Whilst sports performance can’t always be guaranteed a pain-free experience, glucosamine taken on its own or with chondroitin may help to keep those joints strong and less painful for longer. If you have diabetes, it is recommended to speak to a health professional before taking glucosamine, as it might increase your blood sugar level and mean that you need to adjust your treatment to make sure it carries on working. As glucosamine is often made from shellfish, if you have an allergy, it is also recommended that you look for a non-shellfish alternative. Nutrabiotics joint care product contains both glucosamine and chondroitin to help support joints from wear and tear of everyday life. Click here for more information about nutrabiotics joint support.